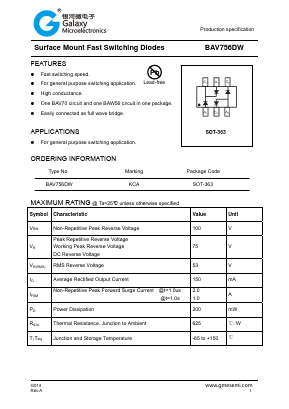 â For general purpose switching application. â One BAV70 circuit and one BAW56 circuit in one package. â Easily connected as full wave bridge. MMBD4448W-7 SURFACE MOUNT FAST SWITCHING DIODE View Diodes Incorporated. LL4150 SURFACE MOUNT FAST SWITCHING DIODE View Diodes Incorporated. 1N4448HWS-7 SURFACE MOUNT FAST SWITCHING DIODE View Diodes Incorporated.